Looking for the meanings of the cards? Click THIS LINK, Adobe Acrobat Reader required. (prints on 6 pages, no images). "The Rabbit Tarot should not be overlooked. It lends itself to just about any reading situation, be it divination, meditation, or a complete toolbox for personal transformation. It is nothing short of brilliant. "-Dan Pelletier, The Tarot Garden. The artist Nakisha had been reading tarot cards over 30 years. 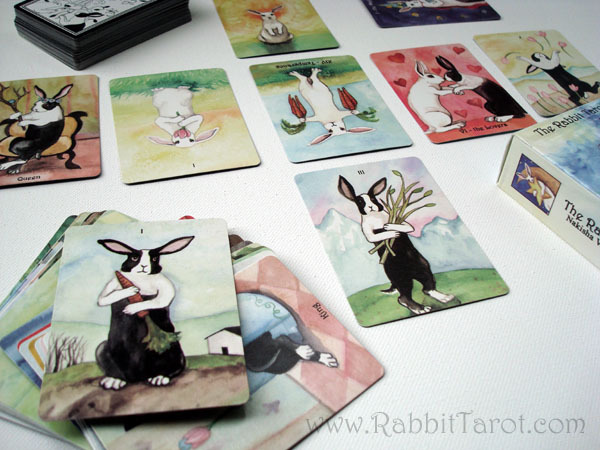 In 2009 she began work on the Rabbit Tarot. Eventually the project consisted of 78 unique images, including the classic 22 Major Arcana and the 56 Minor Arcana, all re imagined into the world of the Little White Rabbit. The Rabbit Tarot features the Little White Rabbit and the Dutch (black and white) Rabbit. Instead of pentacles there are daisies, instead of swords there are carrots, tulips are cups and sticks are clubs. This unique tarot deck is appropriate for all ages, especially those who collect tarot cards, rabbit fanciers, art collectors and the young at heart. The Rabbit Tarot companion Book with updated descriptions and images, is available for purchase direct from the printer, click THIS LINK to purchase. The First and Second Edition may be found on Ebay or offered for sale from private collectors, only 300 decks of the first edition were printed. There is a mini edition available occasionally on Etsy, and in 2019, a Deluxe and a Limited Edition 10th Anniversary deck is in the works. If not available on Etsy, some of these decks can be found at The Game Crafter. Strength is a subtle and powerful rabbit. Courageous, determined and mindful, Strength indicates physical strength, fortitude, and conquest over adversity. It can indicate accomplishment or attainment after difficulty. Strength takes charge of a situation or responsibility for actions. Reversed: When Strength is reversed it can mean being overpowered or overwhelmed, not being in control, or struggling with adversity.